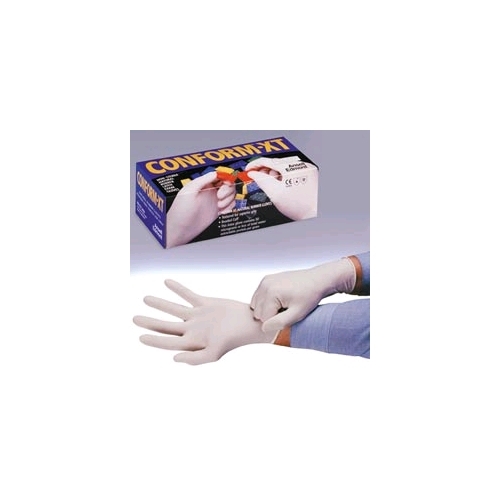 Conform XT is 100% natural rubber latex but, in addition, features a textured grip and qualifies as a Class I Medical Device. Provides the highest degree of dexterity available with the strength and comfort of 100% natural rubber latex. For lab analysis/technical work, intricate parts handling, food processing and handling, quality control, electronic assembly, light-duty maintenance and cleanup. Meets FDA 510K regulations. Fits either hand. White, Non-sterile. Laboratory analysis/technical work • Food processing and handling • Quality control • Electronics assembly • Light-duty maintenance and cleanup. Component materials comply with FDA regulations for food contact. Caution: This product contains natural rubber latex which may cause allergic reactions in some individuals.